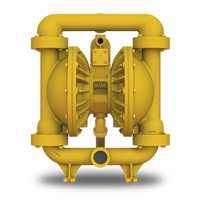 Versa-Matic® is pleased to introduce the new Elima-Matic® E40 1 ½” metallic bolted line of pumps. The new E40 models are the latest addition to the Versa-Matic product offering, featuring the newly enhanced, exclusive Elima-Matic® Air Valve System, delivering consistent on/off/on reliability, while maintaining superior air efficiency. Available with several extended-life diaphragm styles to choose from such as the patented Versa-Dome™, and PTFE FUSION™. Click here for E40 Metallic Brochure. Click here for E40 Data Sheet. Click here for E40 Service Manual.